This is the movie that made me a Jack Benny fan. My path to being a Benny fan was a weird one, and for years I honestly loathed the man. Actually, there was nothing honest about it, as all I knew about Benny came from my parents. As a kid, my friends’ parents would reminisce about the Beatles and “Gilligan’s Island” and other pop culture from the 60s. 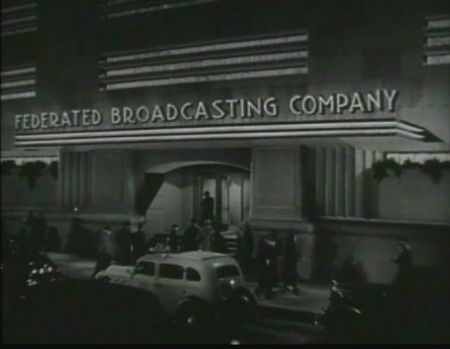 My own parents, a generation older, thought back fondly to radio shows and early television where advertisements were worked into the plot of the show. 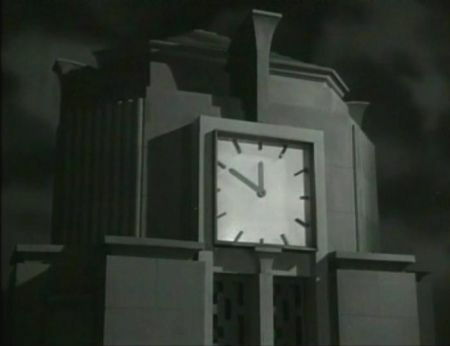 They preferred a show where the Carnation spokesman would walk into Gracie Allen’s kitchen and start telling everyone about contented cows, and they groused about show-stopping commercial breaks louder than Alfred Hitchcock ever did. I exaggerate a bit, but I’m pretty sure I hated Benny and HBaM by the time I was a wee 10-year-old. I was in my 20s before I stopped rebelling against my parents and paying attention to Benny’s actual performances, but I submit that if you knew my parents’ taste in entertainment, you’d understand that my “hate everything my parents like” rule kept me in good stead for many years. In the first moments of “The Horn Blows at Midnight”, we’re treated to a host of terrific character actors: Margaret Dumont, Guy Kibbee, Franklin Pangborn, Mike Mazurki, Dolores Moran, and John Alexander. Oh, and Allyn Joslyn, a character actor who, like Burton Churchhill, shows up in so many films that I have half a mind to start an Allyn Joslyn Watch. Stars Jack Benny and Alexis Smith head the cast, directed by Raoul Walsh. Whew, what a list! Common wisdom tells us that you can’t go wrong with this much talent, and to that I have only one word to say: “Skidoo.” Thankfully, HBaM is no “Skidoo”, but Jack Benny made so many jokes about this film ruining his career that most people, if they’ve heard of the film at all, are convinced it’s a rotten movie. Benny plays Athanael, a trumpet player in a radio orchestra. 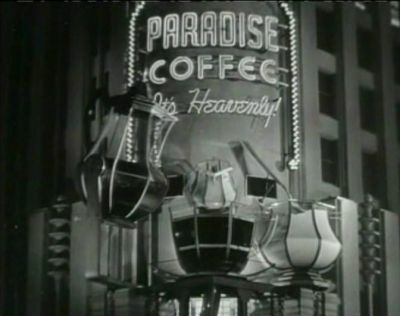 During a Paradise Coffee commercial — “Paradise Coffee: It’s Heavenly!” — Athanael falls asleep and dreams he is an angel in Heaven. As you’d expect in a comedy fantasy, everyone and everything you see in the opening segment returns in another role during Athanael’s dream. In Heaven as on Earth, Athanael is a lovable loser. He is an angel but only Junior Grade, of the 3rd Phalanx, 15th Cohort. Playing 2nd trumpet in Heaven’s orchestra, he is anxious for a promotion and a chance to play solos. His girlfriend Elizabeth (Alexis Smith) is the secretary to the Deputy Chief of Operations in charge of the Department of Small Planet Management. Not only is Heaven portrayed as a large business office full of bureaucratic red tape, but it’s also stated that Earth is just planet #339001 out of several hundred thousand other planets. I’m a little surprised that contemporary audiences didn’t have a fit about that, but perhaps 1945 society didn’t get riled by the same things 2010 society does. “The Horn Blows at Midnight” is starting to shake off its decades-old bad reputation thanks to VHS and TCM, although it hasn’t yet been released on DVD. Granted, this ain’t no “Citizen Kane”, but it’s not supposed to be. The comedy is mostly one-liners and slapstick, all of which is very Looney Tunes, so much so that even the song “The Merry Go Round Broke Down” appears more than once. There are technical issues such as dubbing speech for a character when their mouth is closed and the unhappily obvious use of stunt doubles. In the interest of happy fun times entertainment, though, you should ignore all those problems and just let the movie make you laugh. Elizabeth convinces the Deputy Chief (Guy Kibbee) to use Athanael for an important job. Earth is scheduled for demolition and the usual guy is busy demolishing a particularly big planet, so the Chief sends Athanael down instead. The Chief isn’t keen to send someone else for the job, but there are staff shortages in Heaven and problems with middle management. To straighten out the bureaucratic mess, “they better start letting in a few big businessmen up here,” complains the Chief. Athanael arrives at 11:15 PM. New York time, I’m assuming, but this is a light comedy and the logic of time zones simply doesn’t enter into discussion. Thus begin the one-liners, and while usually this kind of weak set up just to throw out a dozen one-liners irritates me, in this case it’s pulled off well. One of the first things Athanael does on Earth is accidentally thwart Archie’s plot to steal Lady Stover’s pearls. 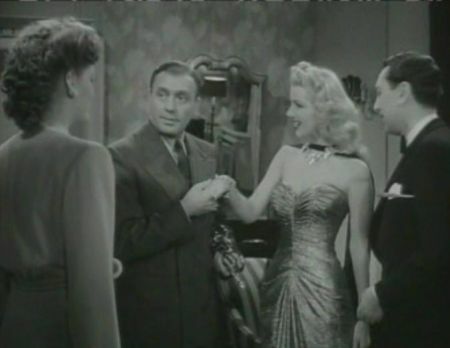 Archie blames the failure on his beautiful young cohort Fran (Dolores Moran, Miriam “Histrionics” Hopkins’ daughter in “Old Acquaintance”). Fran is devastated that Archie, whom she loves, immediately discarded her when he didn’t get Lady Stover’s pearls. Eventually Athanael is spotted by Osidro and Doremus, two fallen angels who had been sent to Earth a long time ago and who never returned to Heaven, instead choosing to stay on Earth to revel in its copious delights. Fallen angels can never be let back into Heaven, so they are desperate to stop Athanael from blowing his horn, knowing the destruction of Earth means they’ll be sent to Hell. Stopping him is complicated by the fact that touching an angel in anger also results in eternal damnation, so they set out to convince him to stay on Earth for the wine, women, and girdles. Yes, girdles. Really. I’m not making that up. So, Athanael misses midnight just like everyone but Elizabeth said he would, and the Chief is hopping mad. While Elizabeth tries to convince the Chief to let her go down and fix things, Osidro and Doremus convince Athanael he’s now fallen. He really isn’t, but Athanael is nothing if not unbelievably naive. They talk up Earth and its pleasures, but there is just one minor problem: Fallen angels suffer tremors every hour at half past, “just like a radio commercial.” You see what they did there? Clever! Athanael would rather play trumpet than get into Osidro and Doremus’ business of bootleg girdles (“Not that I have anything against girdles,” he assures them) and is given a job playing at a jitterbug contest with Slippy Tompkins and his Twelve Tom-Cats. HA! I love that name. Athanael isn’t exactly down with the hep jive, and the loud swing band literally blows him away with their jazzy rendition of “Swing Low Sweet Chariot”. 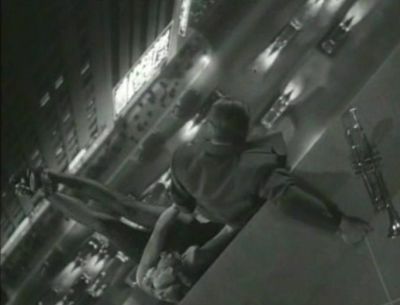 His solo falls flat and he’s tossed out onto the street. Athanael is an angel, and by that I assumed he had once been a living person on one of the several hundred thousand planets under Heaven’s domain. Yet Athanael has never had food (among other things) before, and it appears that the fallen angels hadn’t experienced food (and other) delights either. I am fully aware I am overthinking things, but where did these angels come from if they weren’t formerly living things who went to Heaven after kicking the cosmic bucket? Athanael discovers food and partakes of a disgusting meal of herring, onions, oyster stew, ice cream, and a huge dill pickle. He can’t pay because he doesn’t know what “dollahs” are, so the restaurant holds his trumpet in lieu of payment. Meanwhile in Heaven, the Chief allows Elizabeth to go to Earth to help Athanael. When Osidro and Doremus find out he’s got another chance, they ask master criminal Archie to steal his trumpet, unaware that the trumpet is still at the restaurant. 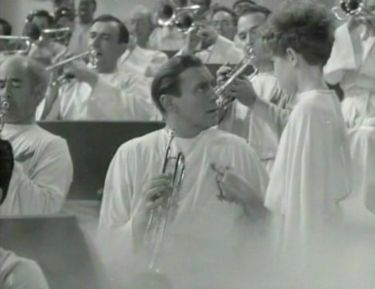 When Archie finds out that Athanael prevented Fran from jumping off the building, he realizes Fran has an in with Athanael and enlists her help to get the trumpet. Elizabeth wins some money and they manage to pay the restaurant those “dollahs” Athanael owed, but the waiter has given the trumpet to his kid, Junior (a young Robert Blake). Athanael finds Junior at the carnival and, after wacky carnival hijinks, gets the trumpet back. While he’s being shot out of cannons (true story), Elizabeth is back at the hotel being swindled by Archie as he pretends to be a famous orchestra conductor. Athanael returns and quickly realizes Elizabeth has a crush on Archie, so when Fran arrives dressed to the nines, he uses the opportunity to try to make Elizabeth jealous in return. Check out that dress on Fran. My stars. Athanael doesn’t know what to do with girdles, let alone women, so when Fran tries to distract him she’s forced to physically throw herself at him to get him away from the trumpet. She’s as lewd as she can be in 1945 (“Athanael, can’t you see what my eyes are saying?” “Yes, and you ought to watch your language!”) and it takes forever, but she finally liberates the trumpet from Athanael. Elizabeth again has to come to the rescue, which she does when she realizes Osidro and Doremus are also at the same hotel and must be the culprits. Whether Benny is daintily sniffing a rose, deliberately making his wrist go limp, or biting into a giant juicy pickle, he is never less than 100% heterosexual! Seriously, though, Benny’s effeminate mannerisms were part of his shtick, and he makes the most of this particular trademark in HBaM. I’ve been watching a lot of Jack Benny movies lately and I am loving his performances, which might sound odd since he played himself in half the movies he was in, but it’s the truth and I’ll stand by it. One of the films I watched was Benny’s first movie “Chasing Rainbows” (1929), a film where he hadn’t yet developed the stingy, bad violinist, or effete loser guy shticks. I’d estimate that approximately 0.01% of us care whether Benny was gay or not, but I do think that those who insist he was gay do so because they saw his later work — especially the TV show — and assumed his screen antics were true to life. 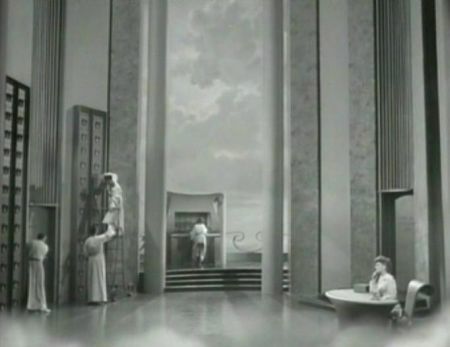 Back at the film, the Chief arrives via heavenly elevator to help just as Athanael steals the trumpet back. Athanael, of course, falls off the roof again, grasping defeat from the jaws of victory. Eventually, almost everybody falls off the roof. Only Arthur, Fran, and Elizabeth are left up top to keep the dangling human thread of idiots from plunging to the street below. Through more slapstick antics, Athanael ends up in the enormous mechanical Paradise Coffee ad just outside the building. The coffee pours in, then cream, then sugar, then it all drains out and happens again. He gets swished around, beat up by the sugar spoon, and eventually knocked off the cup to his assumed demise… but he wakes up in reality to the soothing announcer’s voice narrating the energetic awakening of a good morning, courtesy Paradise Coffee. The supporting cast is solid, reliable, and funny. 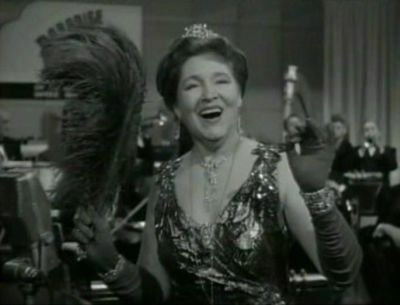 I know Groucho Marx once said that Margaret Dumont never got any of the jokes in the Marx Brothers films she was in, but this performance makes it clear that she obviously had a sense of humor. Alexis Smith seems a bit out of place and bored with everything around her; I expect her to start scolding everyone a la Graham Chapman and insist that the movie should be shut down due to silliness. A great story about your parents and Jack Benny. Benny can get more laughs with just a look than anyone else. I always thought this film was decent, not a must see, but pleasant enough. For me it goes to the liability of the actors and I like Benny and Dumont, they are always a pleasure to watch. Only about a week or so ago I had the opportunity to listen to the radio version of this story (the Ford Theater Show) with Benny, and Claude Rains in the role of the chief. This version was more straight forward with Jack actually an Angel sent to Earth to destroy the troublesome planet. Athaniel’s dilemma is should he really blow up a planet that has just suffered the agonies of World War 2 or give them another chance. Hey, to answer your question, there are a few movies in which angels are dead people – in fact, I blame It’s a Wonderful Life for the misconception – but no theology of the same opinion. They’re their own thing… spiritual beings, messengers, I don’t know, there’s probably a boring web site about it somewhere. Most angel movies (let’s see: Dogma, Date with an Angel, Michael, Wings of Desire – I never actually realized there were so many angel movies!) stress that the angels are unfamiliar with human pleasures, which they usually end up enjoying a lot. I know it’s a horrible stinking mess, but I loved Skidoo. I’m sure that’s mostly due to my obessession with Nilsson and the fact that I saw it projected on the back of a house with a yard full of drunks. Sometimes it’s all about the audience! Anything with Margaret Dumont couldn’t be all bad. After “To Be or Not To Be” my favorite is “George Washington Slept Here.” I’d LOVE to see this one, especially because I’ve heard so many references during the programs. When I was a little girl, I heard a snippet of a radio show when M. LeBlanc chants along during a violin lesson: “Nero played while Rome was burning; For a match I now am yearning.” It took YEARS of listening to programs but I finally found that episode last month. I’d remembered the line almost exactly. I think I became a fan the very first time I heard him. Jack, the joke earlier in the movie about letting some big businessmen into Heaven kind of confuses the issue. That definitely made it sound like angels were the spirits of the dead. KC, I like “Skidoo” a LOT, but I also acknowledge it’s not a good movie. Shahn, I love “To Be or Not To Be” and “George Washington Slept Here”, too. I only watched HBaM to see how bad it was, and was surprised to find it wasn’t bad at all. Next I saw “George Washington” and really liked it, although the forced patriotic ending takes the wind out of the film’s sails. Carl Stalling explains so much! I knew there was cartoonish intent, especially with the cannon bit when Athanael goes to look for his trumpet, but didn’t realize Stalling himself was involved. Oh! I get it. I missed that. I guess if I want to make the movie theologically consistent, I’d have to say that dead people go to heaven, of course, but just as departed souls, not angelic beings. Now I feel better! This movie starts off promising as we follow Benny’s foruntes as an angel and his first episode with the fallen angels in the NY hotel is well done. But the film soon goes sour as it is too broadly played after the first scenes. Stretches of this film are silly at the very least and boring, at the worst. 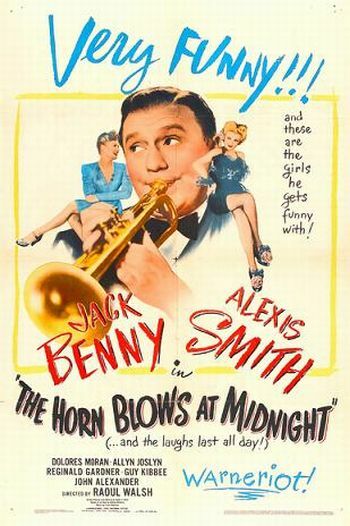 That said, Benny is quite funny and Alexis Smith is quite endearing. It’s a shame this film ended on such a dumb note, as this could have been a minor classic. The Horn Blows at Midnight is a lot cuter than I expected. I’m especially fond of “Buck Benny Rides Again”. When I was a kid, my parents said if anyone asked how old my father was I was to say, “He is the same age as Jack Benny.” My father was actually 42 when I was born. Like you, I was raised on an older generation of entertainment. My parents thought most TV was junk. To this day, I have never most 60’s-70s’ shows popular with my generation, but I love movies from the 30’s!